Her Excellency the Right Honourable Michaëlle Jean C.C., C.M.M., C.O.M., C.D. [Prime Minister Harper] ducked the test, the fundamental test of his legitimacy to make these recommendations through a prorogation (of Parliament) and he’s now pretending that he has the full legitimacy to move forward. This is an abuse of his power. Reportedly, Mr. Layton asserts that a letter allegedly signed by a majority of Members of Parliament (“MPs”), demonstrates that the government has lost the confidence of the House. Today, the National Post editorial board published an editorial that, in effect, argues that the Prime Minister of Canada, Conservative party leader Stephen Harper, should not fill the 18 vacancies in Canada’s 105 seat “upper chamber”, the Senate. They fear that doing so in the weeks leading up to a confidence vote on the budget might result in public discontent, and that such discontent might have the effect of breathing some air into a Liberal-NDP “coalition” that will probably otherwise die after a Michael Ignatieff-led Liberal party votes in favour of the budget. In other words: they fear that filling the vacancies might cause the Liberals to vote-down the budget in January, and trigger an election in which a Liberal leader who has not yet humiliated himself does battle with Harper. It has been reported that Stephen Harper, the Prime Minister of Canada, will meet with the Governor General of Canada this morning (December 4, 2008) at 9:30 AM. Most reporters, though largely speculating, are saying that the PM will ask the GG to prorogue Parliament; i.e., to end this session of Parliament and thereby prevent a December 8, 2008 vote of no-confidence. I submit that it would be a mistake – both for Canada and for the Conservative Party – for the PM to ask the GG to prorogue. It is public knowledge that, in anticipation that the Official Opposition’s December 8, 2008 motion of no confidence will be successful, Mr. Stéfane Dion, Mr. Jack Layton, and Mr. Gilles Duceppe – the leaders of the Liberal, NDP, and Bloc Quebecois (“BQ”) parties, respectively – did, on December 1, 2008 sign a pact with one another titled “A Policy Accord to Address the Present Economic Crisis” (the “Policy Accord”). 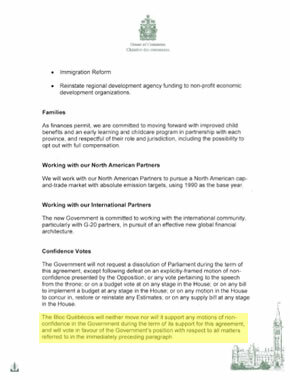 It is widely acknowledged that the purpose of the Policy Accord is to impress upon you that a Liberal-NDP coalition would have the confidence of the House of Commons, such that it could form a viable government. It’s an old theme, retold in many stories. Single meets Prospect who is not all that attractive or charming. Prospect is perfectly honest with Single. However, having misunderstood a conversation Single was listening-in on, Single thinks Prospect is (or is going to be) exceptionally rich. Single convinces him/herself that he/she loves Prospect. Prospect asks Single to marry him/her. Single accepts. They are to be wed. Single really believes he/she loves Prospect or, at least, he/she really wants to believe it. Then Single learns that Prospect is not rich – and is not going to be rich – after all. 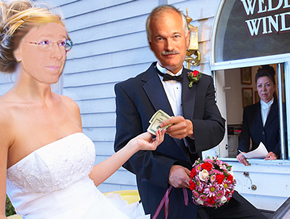 Not wanting to believe that his/her feelings toward Prospect were not genuine; not wanting to believe that he/she was, subconsciously, attracted by money, Single is torn about whether to go through with the wedding after all. If Single does marry Prospect, the marriage may very well amount to a life of loveless misery and guilt. If Single does not marry Prospect, Single will either have to lie to everyone about why he/she has changed her mind or he/she will face their condemnation and – worse – Single will have to conclude that he/she is a shallow person who is willing to marry not for love but for money. Ultimately, Single wishes he/she had never overheard the conversation that led him/her to believe that Prospect was rich.